I am a novice in photography and has heaps to learn about the 3 modes ~'A', 'M' and 'S', how to co-relate the 3 modes to lights, ISO and exposure. My first love was SLR Canon T50, purchased in the mid-80's... In the beginning (during my 'getting-to-know' my camera period), I burnt many rolls of film, and a big hole in my pocket too... to process the film and only to find out that most of the photos were blurry and out of focus. And it was late 2010, I was ecstatic as my hands could wrapped around another DSLR... I chose Nikon...and named it aNDy ..
At the start of this year... I made a resolution to move away from 'Aperture' mode and start clicking in 'M' mode... and I am glad I did. Am I ready to take the big Waves Challenge? Steep teabags in 1 cup boiling water for 2 minutes. Stir in sugar until dissolve. Add in 1 cup of cooled boil water. Halved Kalamansi and squeeze the juice into the tea. Pour into tall glass filled with ice. Beautiful shots! Sometimes the amateur can turn out to be professional too! It is hot here and this Kalamansi ice is the one for me now!! Love you pictures, excellent click. Especially the splash. That drink looks amazing and so refreshing! Great splashy shots. 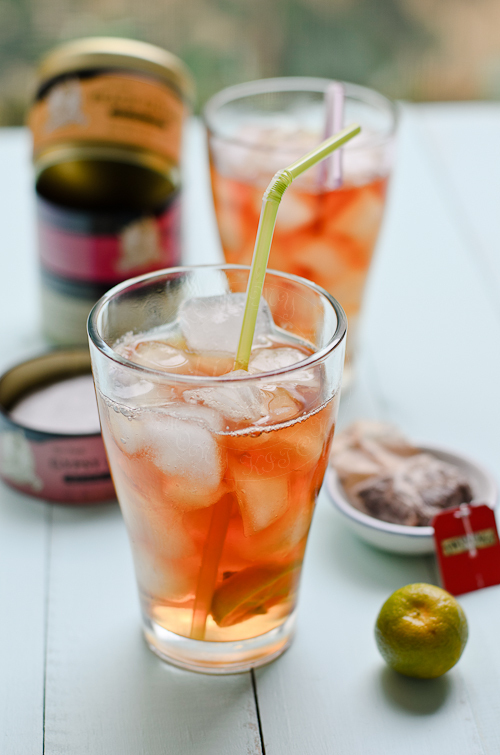 Love that delightful iced tea! I miss kalamansi limes. Haven't seen them here. Love your photos - all that splashing paid off! The next camera i going to get one is Canon DSLR or their latest product EOS M. The "M" mode of my current camera Canon G11 already broken, now i can only depend on "P" and "Auto", hehehe..This drink sound so refreshing! Isn't is fun experimenting with splash shots :) I am a tea drinker and this looks refreshing! I only use the M mode because I dont know how to use the A mode but sometimes it works, sometimes it doesnt. You seriously take amazing shots and it seems so "effortless" too! I am sure you worked hard to get to where you are, but must be a talent too! ;) I enjoy every chance I have to see your photography! give my warm regard to beloved aNdy :). we are in the same line then. I used "M" mood since the very beginning I clicked my camera:). And those pictures (splash) were a nice try .